New Delhi is a now a city that is slowly building its economic foundation and revitalizing its already rich culture, with the help of the undeniable presence of expatriates from all over the world. Moving to a new city is a challenge for any expatriate. This is true especially when the destination is a highly populated city such as Delhi. Finding just the right kind of housing is not an easy task. However, New Delhi responds to the housing demands with the booming real estate industry. The city has numerous housing options - decent and affordable apartments as well as high-end, swanky units. Choosing your preferred community depends on your preferences, more often than not, it would be a choice between cost, convenience, and comfort. Many expatriates prefer to settle or find accommodations in South Delhi due to its proximity to transport connections, business centers, and because of the wide availability of good, affordable housing in the area. The areas in South Delhi teeming with an active expat population are Defense Colony, Green Park, Greater Kailash, Hauz Khas, Vasant Kunj, Safdarjung Enclave, Panchsheel Park and Gulmohar Park. These communities are conveniently located near job districts such as Connaught Place, Noida, and Gurgaon. Property dealers in New Delhi can definitely help you find the best accommodations in the city; the usual fee is based on a commission basis. The amount is normally equivalent to one-month's rent or 2% of the house cost. For accommodations within the city center, monthly rent is about 548 USD (US Dollar) for a one-bedroom apartment, while a two-bedroom apartment costs 490 USD. Staying outside the city center could save you a few dollars; a one-bedroom apartment costs 177 USD while a two-bedroom unit costs about 272. The best way to experience Indian cuisine in this city is through its myriad offering sold on the streets. Be aware though that eating street food will always be risky, so take extra precautions and bring some tummy-friendly meds. Bengali Market near Connaught place is one of the most recommended areas when looking for good eats. The place has high-quality food haunts and ATMs are easily accessible here. Experience the city's famous chaat, which Delhi-style means deep-fried pastry shell, stuffed after cooking with potatoes, lentils or almost anything else. To make the experience even richer, it is then topped with yogurt, chutneys and chaat masala spice mix and eaten fresh. With the arrival of Western companies to Delhi grounds, it also brought in Western fast foods as well. Seeing a McDonald's, KFC, or even a Subway is not uncommon, especially in the malls. The cost of a complete meal in an inexpensive restaurant is about 3.67 USD, while a meal for two in a mid-range place would cost you about 14.27 USD. If you prefer cooking at home, basics like milk cost about 0.36 USD for a liter, a dozen eggs 0.47 USD, a loaf of bread about 0.38 USD, a kilo of potatoes cost 0.27 USD, a kilo of tomatoes about 0.43 USD, a kilo of whole chicken costs about 2.16 USD, while a kilo of lamb chops cost around 1.94 USD. New Delhi offers more than a palatable adventure. Getting around the city is both a challenge and an unforgettable journey. 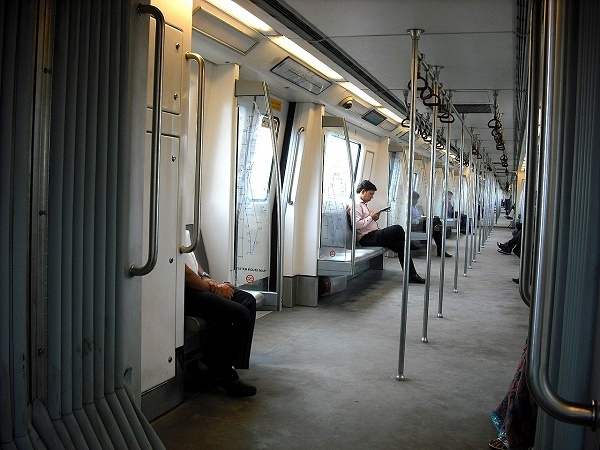 The fastest way to get around would have to be the Delhi Metro. It has three lines coursing through the city's major business districts and locations. Ticket prices range from 8 Rs (Indian Rupee) or 0.18 USD (US Dollar) to 30 Rs or 0.67 USD. If you find yourself travelling a certain route more often, then you can also buy a ‘Smart Card' which allows you to avoid queues. This costs about 50 Rs or 1.12 USD. Taking public buses is also an affordable but a less comfortable option. The fare ranges from 5 to 15 Rs (0.11 to 0.34 USD) depending on the distance you're travelling. Taking a cab is another means of comfortable, though pricier, travel. You can log on to www.tricabs.com or call 01126211290 (or alternatively 1090) to have a cab pick you up. Most taxis are metered, and start at 6 Rs (0.13 USD). Be aware though that some meters may be rigged, so it is best to agree on a price at the onset of the trip. Due to the city's rising population, despite the numerous public transportation options, the roads tend to become clogged with people and vehicles on a daily basis. So expats are advised to secure accommodations in areas nearest to their workplace. Expenses for basic utilities like electricity, gas, water, and garbage on a monthly basis is about 36.51 USD. With the proliferation of easily accessible information technology in New Delhi, internet access became affordable. Cost of an internet connection per month is on an average about 15-31 USD. An exciting expatriate life in New Delhi comes easy on the pocket. With that to consider plus the chance to be part of the city's booming economy, moving to this city becomes an opportunity you shouldn't let pass.